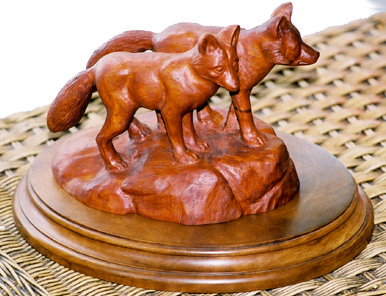 "Foxes" was carved from the wood of an individual Wild Cherry tree that was surplus from the Cherry used in "The Chase. The original woodcarving was carved in 1996 and has taken ribbons in several woodcarving shows. One of the features of Wild Cherry wood is that it will darken and become richer in color with each passing year. The piece sets on a wooden base. "Foxes" is approximately 9 X 7 X 5 inches.